Join us for the 2nd annual USO Challenge a Troop 5k! You’re invited to be a part of the 2nd annual Challenge a Troop 5K on October 15, 2016 at the Craig Ranch Regional Park. 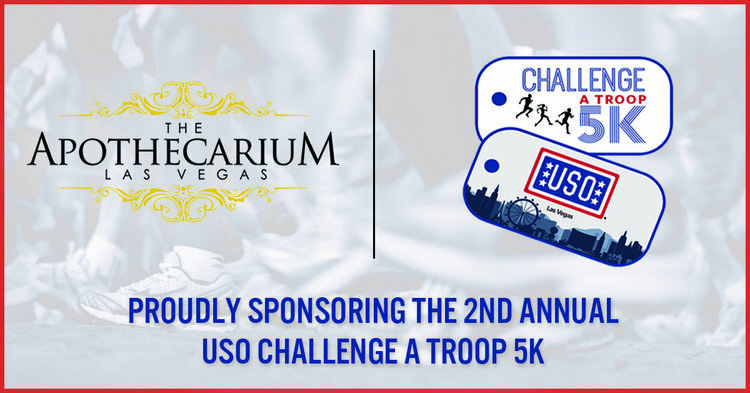 100% of the race entry fees will benefit the USO Las Vegas in creating a “home away from home” and a sense of community for the 32,245 active duty troops, 4,760 National Guard personnel, Reservist, and their families currently based in Southern Nevada. We are offering $5 off race entry using the code ALV5. We are also offering a free pre-roll with proof of registration. Bring your completed registration on your next visit, and you’ll receive a free pre-roll! Our participation is in support of our military, both active duty and veteran. The military community selflessly gives their lives to protect ours, and are the face of true American freedom. We believe our veterans should have safe access to medical marijuana. Current estimates suggest up to 20 percent of veterans returning from the Middle East suffer from Post-Traumatic Stress Disorder (PSTD). Today, the only approved medications allowed by Veteran Affairs have limited value. Many come with significant side effects and risks of addiction. We believe that our veterans deserve the option of utilizing medical marijuana as an alternative source of medicine. Medical marijuana has been shown to be effective for curbing the symptoms of PTSD including: pain, anxiety, sleeplessness, and low appetite. Many veterans who are medical marijuana patients say that it helps ground them when they come across PTSD triggers - and that it has allowed them to regain normalcy in their lives. We are here not only to support our Veterans, but to support all of the active military protecting our freedoms, including the freedom to medicate. We will be at the event providing educational materials, and will be more than happy to aid in answering any questions about medical marijuana. It is pertinent to instill a knowledgeable education in our community to broaden the scope of understanding, and help clear the air of misconceptions. Let’s work together to find the right medicine for you. All content found on the apothecarium.com website, including: text, images, audio, or other formats were created for informational purposes only. The Content is not intended to be a substitute for professional medical advice, diagnosis, or treatment. Always seek the advice of your physician or other qualified health provider with any questions you may have regarding a medical condition. Never disregard professional medical advice or delay in seeking it because of something you have read on this Website. If you think you may have a medical emergency, call your doctor, go to the emergency department, or call 911 immediately. Reliance on any information provided by apothecarium.com, Apothecarium employees, contracted writers, or medical professionals presenting content for publication to the Apothecarium is solely at your own risk. Links to educational content not created by the Apothecarium are taken at your own risk. The Apothecarium is not responsible for the claims of external websites and education companies.